200 kilometres to the south of Moscow lies ‘Yasnaya Polyana’, the ancestral home of Leo Tolstoy. Late-summer is the best time to enjoy the classic Russian landscapes and to immerse oneself in the author’s world, carefully preserved by his descendants. 09.00-10.00 Begin by acquainting yourself with the lives of local inhabitants in the little restaurant ‘Preshpekt’, situated in a wooden house opposite the entrance to the estate. Woven fabrics and embroidery complement the simple wooden interior of ‘Preshpekt’ and you can sample rice porridge with milk or curd pudding with strawberry jam for breakfast. 10.00-13.00 As soon as you walk through the white columns at the entrance to Tolstoy’s Estate, you become utterly absorbed by the green mass of Birches, Maples, Oaks, and of course Ash trees. Owing to the Ash trees planted here some maintain that the name of this location, Yasnaya Polyana is a shortened version of Yaseneva Polyana. True, there is another version linking the name to the clear and pure Yasenko stream, which passes close to the estate. There is a large pond to the left, the surface of which is covered in the small, yellow flowers of water lilies. Walking a little further along the seemingly endless avenue leading to Tolstoy’s house, you can turn to the left and take in the bathing pool where the author’s wife Sophia and the author himself loved to bathe. Setting off along the avenue once again you will see stables and apple orchards on the left hand side, which visitors are also allowed to profit from in the autumn, as well as the Volkonsky’s house. If you continue along a road leading away from the avenue to the left you will come to the grave of Leo Tolstoy. The grave is preceded by an atmosphere of silence and is fully inscribed into the natural landscape, possibly echoing the writer’s ideas on life and death. Returning to the road perpendicular to the main avenue you will pass the Kuzminsky’s house. Do take time to look round it, to view the façade intertwined with flowers and fronted by beds. Walk further on to Tolstoy’s house and admire the equestrian and feminine figurines carved into the balustrade on the terrace. Another few steps and with overshoes on the door to the private life of Leo Tolstoy, left as it was in 1910 when the author died, is open to you. Photography inside is forbidden. A guide will greet you in the first room, lined with bookcases. In all 22,000 books are kept in the house, of which around 50 percent are in Russian and a little less than 39 foreign languages. A significant part of the book collection is in French, which Tolstoy studied particularly intently and in which, for example, he prepared to write the novel ‘War and Peace’. As you climb the stairs, there are large English clocks on the walls. On the right you will see a room, which served as a dining and guest room. The plates on the table are those from which Tolstoy’s large family would eat. There are two portraits of Tolstoy on the walls: one by the hand of I.N. Kramskoy (a second such portrait is in the Tretyakov Gallery) and another portrait by I.E. Repin (the artist painted around 70 portraits of the author). Apart from these, there are portraits of the author’s daughters and his wife. There are also two grand pianos in the room as well as chairs, which would make for social gatherings of adults and children after dinner. You can visit Tolstoy’s bedroom in the museum, where a copy of Dostoyevsky’s ‘The Brothers Karamazov’ lies on the table. This was a book he was reading up until he abandoned Yasnaya Polyana in 1910. You can also visit Sophia Andreyevna’s room, and the nanny’s room among others. The room in which guests of the family would stay can also be seen. According to one account there were so many that the author fled Yasnaya Polyana because of the exorbitant numbers of visitors and all the attention paid to him. The guide also tells of a letter Tolstoy wrote to his wife asking her not to think that he had gone because he had fallen out of love for her, Tolstoy wrote that was no longer able to live in luxury. The guide showed some of the items of daily life, which the author could justifiably call luxurious as well as the room in which the coffin containing his body was placed in 1910. You can walk at your leisure round the estate and the surrounding forest and some may even bathe in the large pond near the entrance. Souvenirs can be purchased either to the right in the ‘Preshpekt’ restaurant, or in the souvenir shop in hotel ‘Yasnaya Polyana’. Prices vary. The assortment of books about Leo Tolstoy and his work include those produced by the publishing house ‘Yasnaya Polyana’, which cannot be found in any other bookshops. 15.00-19.00 Take a walk after dinner from hotel ‘Yasnaya Polyana’ to the opposite side to the estate, a ten-minute walk in the forest brings you to a river, where you can swim or have a picnic. 19.00-20.30 You can watch a show or a film in the ‘Yasnaya Polyana’ recreation centre and then discuss what you have watched with the director, or attend a ‘Dolche trio’ concert. They are graduates of the Moscow conservatoire named after P.I. Tchaikovskiy who now play in the Tula Philharmonic and often perform concerts. Under the ‘Prosveshchenie’ (Enlightenment in English) programme lectures are also held in the ‘Yasnaya Polyana’ recreation centre in physics, linguistics, mathematics, art, biology, and history. On leaving the new recreation centre building with its white columns, you can turn left and take a walk along the one street in Yasnaya Polyana village. On Sunday’s you can head off on an excursion to the historically rebuilt Kozlova Zaseka railway station. The name dates back to the XIV Century when this location was on the southern edge of the principality of Moscow and served to defend against invasion. It was named Kozlova in honour of Governor Ivan Kozlov. The site became a railway station in 1868. Leo Tolstoy’s post was brought here and it was from here that he made his calls. It was from this very location that he left for the south in 1910. He fell ill and died on the way at Astapova railway station. Both local and through trains from Moscow to Tula depart the Kursk station in Moscow heading south daily, and the ‘Moscow-Tula’ express departs at 18.00. You can reach Yasnaya Polyana by taking trolleybus No. 5 from Tula’s Moscow station to the ‘Pedinstitut’, from where buses Nos 114, 117, and 280 take you to the ‘Yasnaya Polyana’ stop. To the right of the bus stop there is a gate with twin white columns and the inscription ‘Yasnaya Polyana’. You will have to pass through this gate and walk around 700 m to the guard post. Buses and route taxis leave Moscow from metro station ‘Tsarytsino’, ‘Domodedovskaya’, Prazhskaya’, ‘Ul. Akademika Yangelya’ to the ‘Avtovokzal’ or ‘Ul. Mosina’ stops in Tula. You can take the bus or route taxi Nos 114, 117, or 280 from the ‘Ul. Mosina’ or ‘9 Maya/Avtovozkal’ stops to ‘Yasnaya Polyana’. To the right of the bus stop there is a gate with twin white columns and the inscription ‘Yasnaya Polyana’ and an incline from the terrace up to the hotel complex (the former recreation centre), a distance of around 800 metres. 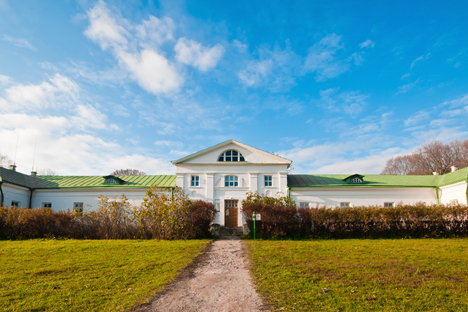 Hotel ‘Yasnaya Polyana’ is a 20-minute walk from the estate. There are two wings, a main wing and a vip-wing. A standard double room costs around 5000 rupees in the main wing and 8000 rupees in the VIP-wing.